It’s not exaggerating to suggest that The Yardbirds are one of the most important bands of the Rock and Roll era. Pushing the boundaries between blues, hard rock and psychedelia, the band helped launch the careers of Eric Clapton, Jeff Beck and Jimmy Page and many of their songs are considered classics. These days, the band consists of original members Jim McCarty on drums and Chris Dreja on rhythm guitar, along with singer Andy Mitchell, lead guitarist Ben King and bassist Dave Smale. The band tours and plays their classic 1960s songs, along with newer material from 2003’s Birdland. 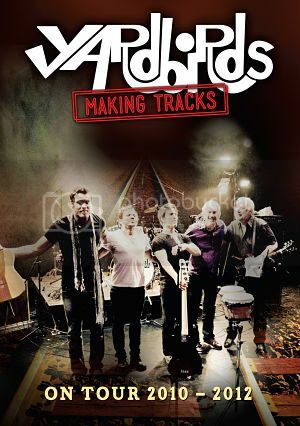 The DVD, The Yardbirds – Making Tracks, captures live performances of the band from several locations between 2010 and 2012. The DVD opens with “I’m Not Talkin’,” and it quickly becomes apparent this lineup is not to be taken lightly. This rocking opener swings and features blistering leads from King. “Drinking Muddy Water,” from the Jimmy Page era of the band, is a hard-charging blues number. Mitchell channels his inner Keith Relf, delivering strong vocals and harmonica while King takes to slide guitar. Dreja tells the crowd that the next song goes back to a time when you needed a pop song to play nationally before the band launches into a spot-on “Heart Full Of Soul.” The band’s trademark harmonies are intact in this stellar performance. The harmonies are evident on “For Your Love” as well, as the band play a strong version of their earliest hit. It’s not all old songs, however. “My Blind Life,” from Birdland, offers a swampy guitar groove courtesy of Dreja that provides a perfect backdrop for King’s slide guitar. Another Birdland track, “Mystery Of Being,” has a Middle Eastern Drone in its intro before descending into a dreamy state. The band’s heavier material is well represented with tracks such as “Shapes of Things” and “Think About It.” King does Beck and Page proud with his guitar work on these blistering tracks, the latter of which offered clues as to Page’s direction with his next band, Led Zeppelin. Disc two is filled with bonus features, including: Glimpses – The Tour Documentary, interviews with Dreja and McCarty, additional live tracks as well as performances from the Jim McCarty Band. King has arguably the hardest job in the band, having to emulate three guitar heroes, but he does so admirably. This lineup is potent and it would be interesting to see what they could do in the studio. The Yardbirds – Making Tracks shows they definitely deliver on the live stage.